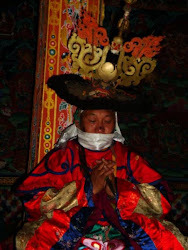 Sumthrang Monastery: The blog and the monastery. Sumthrang Monastery is one of the oldest monuments in Bhutan established by son of Nyo Gyelwa Lhanangpa Sangay Raychen(1164-1224) and is looked after by the continued rosary of his linage. It was believed that his son Nyo Dechog alias Dechog Nyoton Trulzhig Chojey established this monastery following the directives of his father and so is the first incumbent of the monastery. Dechog Nyoton Trulzhig Chojey travelled to Bhutan via Monlakarchung mountain passing through Choker toe and Tang valley looking for this place following the directives. It was at the later age of Nyo Gelwa Lhanangpa few years before his death the Sumthrang monastery was founded by his son under his directives. This blog contains personal views and small research articles by the author that deals with history of Sumthrang monastery and its family. Some published articles may be found contradictory to one another as the author goes on writing with his recent findings. The author would be revisiting his past articles to correct in line with his recent findings. Cheers to all the readers...!!! Yes Tim partially right. but local would pronounce it as Sombrang not Sumphrang. In choekye Sumphrang will be pronounced as 'Sumthrang' as you would probably know. I used Sumthrang, to get the pronounciation right although while writing in choekey/dzongkha it can be transliterated as Sumphrang. But meaning is quite different, it is not three dangerous or treacherous path. It means the place of tri-junction. Because the old path from Bumthang Tang to Lhuentse via Shingkhar passes from Sumthrang and a path from Ura joined the east west path at this place making it a tri-junction, which is referred to as 'lam Phrang sum dang gdn pai gnys' (La'm thrang Sum dang dhen pai nye). That's why I used Sumthrang for Sumphrang in English phonetic and it is not transliteration of the name in choekey. If I am to use the transliterated version of the name then you are right it should be Sumphrang. Any ways thanks it was a helpful comment. Thank you very much.